A deep fried snack made with ragi flour and rice flour as main ingredients. It is one of the ragi dishes which will be liked by all the kids though some kids do not like ragi idli and ragi dosa. I have prepared Ragi murukku 3 times before. I felt that it has been a long time since I prepared deep fried snacks at home. I bought a pack of ragi flour last time when I went for shopping. Without second thought, I have decided to prepare ragi murukku for evening time snacks. Though it is a very good festival recipe, it is a perfect snacks box recipe too. My kid likes it very much. 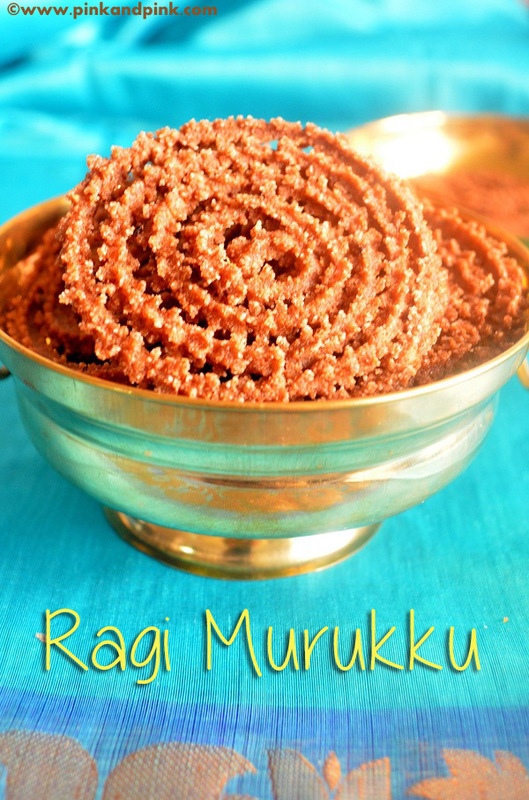 I have never packed ragi murukkuThough it is a very good festival recipe, it is a perfect snacks box recipe too. My kid likes it very much. I have never packed ragi murukku for my kid's snacks box. I mostly pack fruits or nuts. I prepared ragi murukku day before yesterday and I packed it for my kid's snacks box yesterday. I packed 3 mini murukku and 2 boost biscuits for safer side. To my surprise, 3 mini murukku were eaten and 2 boost biscuits were kept untouched by my son. Not only my kid liked it, my hubby also liked it very much. He just told that it tastes 'super' :-) What else would one need? I am super excited. I posted the picture of ragi murukku day before yesterday in Instagram. I have shared in facebook and twitter as well saying that the recipe would be posted the day after. Most of the friends liked it and mentioned that they are waiting me for the recipe. I am really sorry for not posting yesterday as I was help up with birthday cake preparation yesterday as today is my kid's birthday. I made eggless chocolate cake in pressure cooker. I topped it up with chocolate glaze. I made cream cheese frosting for writing and cute fondants too for decorating. All the recipes will be lined up very soon. So, stay tuned. Now let us see how to make ragi murukku. Powder roasted gram(pottukadalai or porikadalai) in a mixie. Take a wide mixing bowl. Add rice flour, ragi flour, powdered roasted gram, cumin seeds, sesame seeds, red chilli powder, asafoetida, salt, butter or ghee. Mix well. Boil water in a pan. Once it starts boiling, switch it off. Add water little by little and make a soft pliable dough. Use a spoon to mix initially when the water is too hot. Once you are able to manage with hands, you can use your hands to make the dough. The dough should have moisture content to make murukku. So, you need to add few more drops of water while making murukku when compared to the water to be added for making chapathi. Taste the dough and adjust the ingredients if required. Heat oil in a kadai for deep frying. Meanwhile, grease the murukku press with oil. 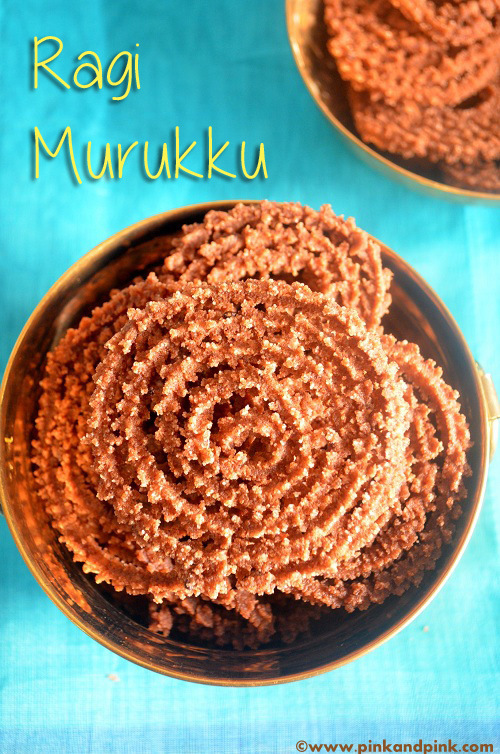 Fill the murukku press with the ragi flour murukku dough. It is always good to check with less dough initially and then fill the press completely with the dough so that you can correct if anything is wrong with the dough. I used one star plate. You can choose the plate which you like the most. But make sure that you are comfortable with the no of holes. Check whether murukku is coming out properly and you can make in round shape. If the dough is breaking frequently, it means that you need to add little more water so that it is little bit sticky and does not break. If the dough is too watery and sticking to the press, you have to add more rice flour and knead it again. Cover the dough with a lid or wet cloth to keep the moisture content till you finish making murukku. If it gets dried up, make sure that you sprinkle some water to retain the moisture. Grease the backside of ladle with oil and make round shaped murukku on the ladle using the murukku press(picture in the following step). You can make 3 medium size murukku and keep it ready at a time. If you are very comfortable in pressing murukku directly on the oil, you can ignore this step. Once the oil is hot, drop a pinch of murukku dough in the oil. If it rises immediately, then the oil is ready. Drop the murukku in the oil by turning the ladle upside down. Turn the ladle upside down on the oil fast. If you turn it slowly the murukku might lose its round shape while dropping. Also, drop from the appropriate height to avoid oil coming to you outside. Try to drop the murukku in the center of oil as it is very easy to retain the shape as it is while dropping. Once you drop a murukku, move it to one side side to allow another murukku to be dropped in the center. Do not overcrowd the oil with murukku. I have a medium sized kadai and I limit myself with 3 medium size murukku at a time. It should be based on the size of kadai and murukku. Deep fry it till the sizzling sound of oil reduces to minimum. As the color of the ragi murukku dough is already brown, it is not very easy to judge whether the murukku is cooked by its color. Turn upside down and cook appropriately. Follow the same for the remaining murukku dough. Allow the murukku to cool down and store it in an airtight container. Ragi murukku is ready. That sounds delicious and looks so very pretty! I'd love to serve these with hot tea. RAGI murku looks so delicious. It's a wonderful idea to experiment with different grains and I thought using RAGI as an ingredient is quite creative. The murkus look so perfect and yummy. 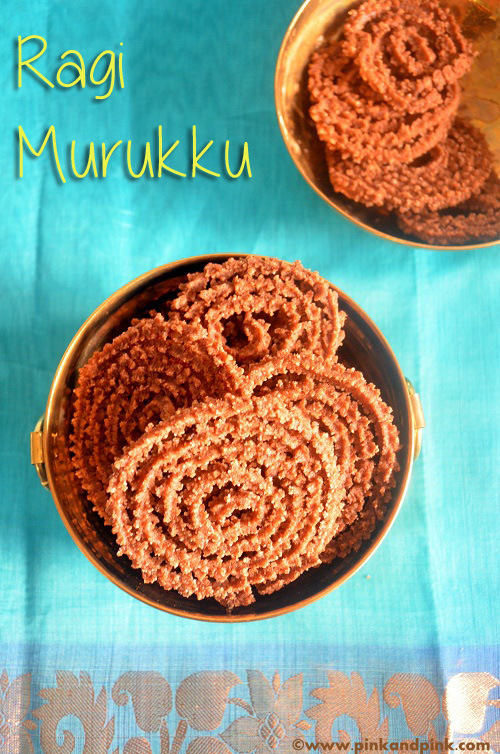 I love murukku always, but never tried. This pic makes me to try soon.